I like fireworks photos but in my view, what makes a fireworks photo memorable is not the fireworks themselves but capturing the fireworks with an interesting foreground that provides context. During last week's Independence Day celebration, I wanted to get a shot of fireworks over the building above, called the Theme Building, one of the most famous buildings in Los Angeles. 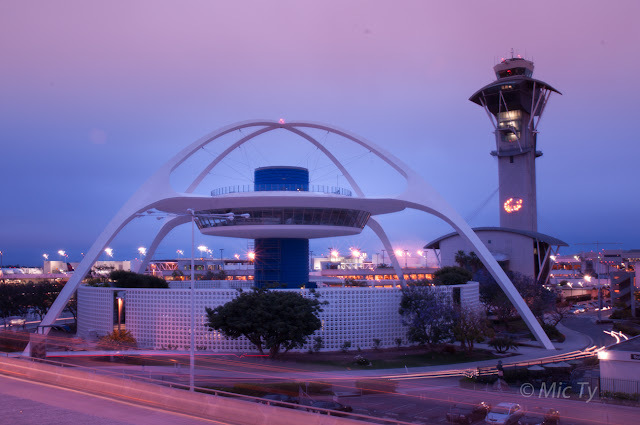 The challenge is that the building is part of Los Angeles International Airport, and of course, fireworks are prohibited at the airport. Fortunately, with a little planning I was able to get a shot of fireworks over the Theme Building. The only major fireworks display anywhere near the airport is at a park about a mile and a half away from the airport (approximately 2.4 kilometers). If I had taken a shot from the same vantage as the shot above, the fireworks would have looked tiny in the background. To make the fireworks appear as if they were over the building, I had to change the perspective by moving farther away. The farther away I am, the smaller the foreground object will be, compared to the background (until the size of the foreground object reaches the actual size ratio). Given the large distance between the Theme Building and the fireworks, I had to move very far away. 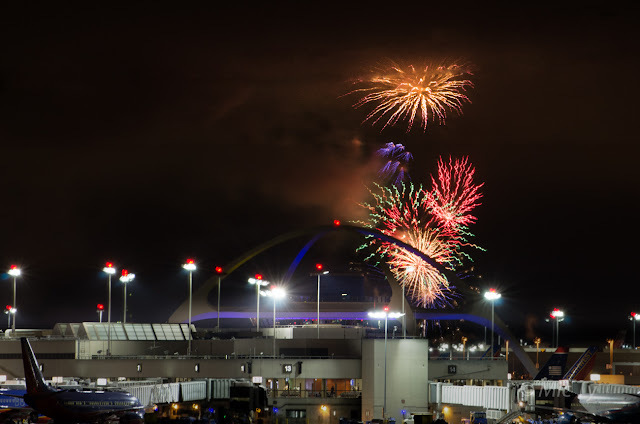 Using a map, I traced the line from the fireworks to the Theme Building, and I followed that line to a point that was about a mile from the airport, which would put the fireworks immediately behind the Theme Building. I've never taken a fireworks photo from that spot before, so I just had to cross my fingers. I brought with me my Tamron 70-300 VC. I paired it with the Nikon D7000 to get a longer effective focal length of 105mm to 450mm. Although the Nikon D600 can also be cropped to DX, the D7000 has 16mp versus the 10mp of the DX-cropped D600. For my tripod, I used the carbon fiber tripod I got from Costco. When I got to the spot, I saw that the D7000 and Tamron 70-300 VC combination was long enough to take a photo of the Theme Building even from that distance. Now the only question was how the fireworks would look from that spot. Unfortunately there were very thick and low clouds that night. I guessed that the fireworks would not be visible. When the time came for the scheduled fireworks, I looked at the Theme Building, hoping to see fireworks but not expecting anything. A few minutes passed with no sign of fireworks. With a sigh, I turned the camera around to the surrounding neighborhoods to take a shot of some of the fireworks. A few minutes later, I looked back at the Theme Building and there they were -- the fireworks 2.5 miles away, visible over the Theme Building, just as I had hoped. Here is one of the shots I got (you can see the clouds were so low that they blocked part of the fireworks). 210mm cropped to about 300mm (450mm equivalent). The terminal blocks the lower part of the Theme Building, but fortunately its distinctive profile is visible and immediately recognizable. Next year, I'd like to try to get a shot from a higher spot so that more of the Theme Building can be visible, and hopefully, the skies will be clearer.